To bridge the gap between the marketer’s need for quality lead data and our members’ ease of access to content, we created LinkedIn Lead Gen Forms. 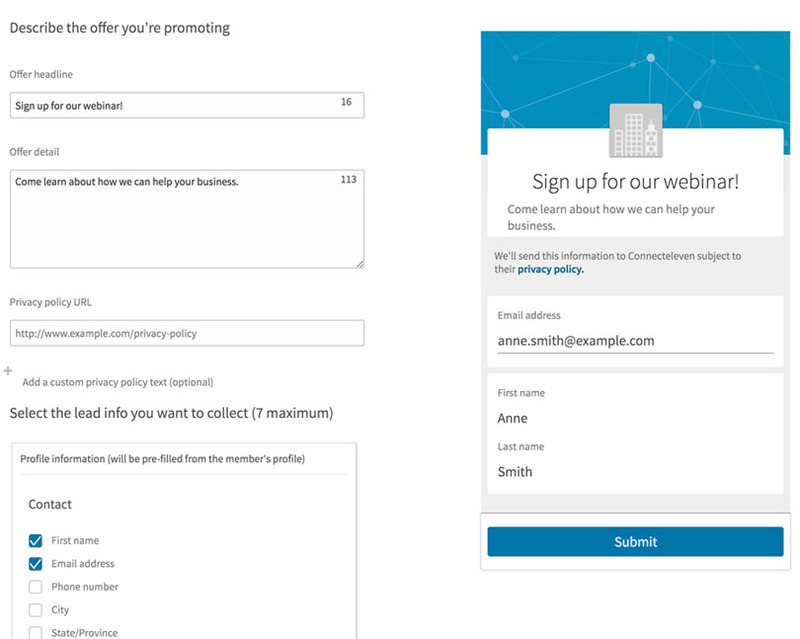 Today, you can add a LinkedIn Lead Gen Form to your Sponsored Content campaigns. Soon, you’ll also be able to add it to your Sponsored InMail. These forms have shown to increase both lead volume and quality, making it easier for marketers like you to prove the ROI of your LinkedIn marketing campaigns. Bynder, a software company, for example, used Lead Gen Forms to increase leads from its Sponsored Content by 400% and achieved a 20% conversion rate. Our internal data shows that LinkedIn’s Lead Gen Form campaigns increase conversions by 2-3x when compared to standard Sponsored Content campaigns. Whether you want to promote whitepapers, newsletter sign-ups, or a webinar. 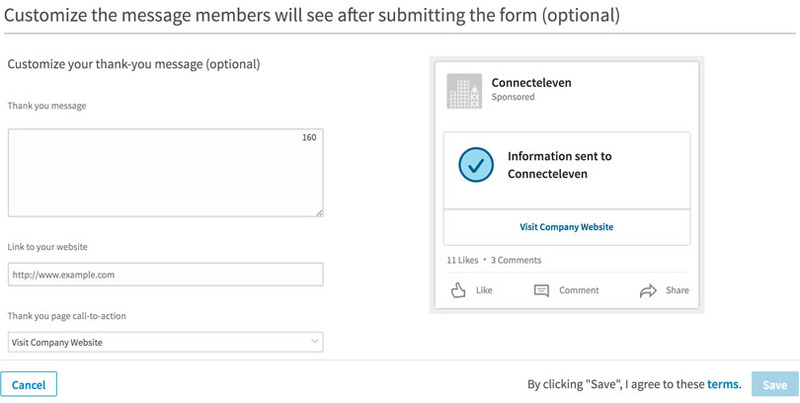 Lead Gen Forms make it easier for members to connect to you while giving marketers what they want: accurate data. Here’s how to get started. Log into LinkedIn Campaign Manager and select the account you’d like to create Lead Gen Form templates for. Under “Account Assets”, click “Lead Generation Forms”. There are 3 parts to creating a Lead Gen Form template, which you can save and use for future campaigns. You can select up to 7 fields to add to your form template. Forms will be pre-filled with data from a member’s profile and members can edit fields that are missing. Because forms come pre-filled, advertisers can expect quality leads and higher conversion rates. Once a member submits her information, she will see a thank you page. You can also provide additional information here with various thank you page call-to-actions. Once you’ve created your form template, you are ready to add it to your ad. Today, you can add a Lead Gen Form to your Sponsored Content. When you set up your Sponsored Content campaign, simply select the option to “Collect leads using LinkedIn Lead Gen Forms”. Once you create your content or select which content to sponsor, add a call-to-action button and add a Lead Gen Form you just created. You can also create a new form template here. You can download lead lists from Campaign Manager or sync leads with the marketing automation or CRM system of your choice through our partners Driftrock and Zapier. You can also send their lead data directly to their Marketo, Oracle Eloqua, and Microsoft Dynamics 365 accounts. To download leads directly from Campaign Manager, click on “Account Assets” in your account. Then click “Download” for the form template you’d like to download leads from. You’ll need to be a Company Page admin or have a Company Page admin grant you Lead Manager Access to download leads. To see campaign performance for your lead gen campaigns, click on the “Leads” tab in your Campaign Manager dashboard. Here you’ll see key performance metrics including the total number of leads, orm completion rate, and total cost per lead. Marketers have access to lead data for 90 days. To protect our members’ data, we delete all lead data after 90 days. We recommend you download your lead data frequently for your record or simply set up an integration so that leads flow into your CRM or marketing automation in real time. Make sure images and copy are relevant throughout. As member clicks from the update through the form, make sure the messaging is consistent. For example, if you are asking members to sign up for an infographic, make sure you either send them the infographic via email or link to it on the “thank you” page. Be direct, and verify that your messaging matches the CTA. Keep in mind Lead Gen Forms are bottom funnel. Be upfront with the value the member is getting by giving their information. If opens are high but leads are low, it could be that you have too many fields. Put yourself in the member’s shoes - you’re less likely to submit 7 fields rather than 2. Typically, we recommend advertisers have 3 to 4 fields at most. Try not to include fields requiring manual input. Phone number and gender, or fields that may not be listed on a member’s profile already, require the member to manually type their information in before submitting. Members cannot submit a form with blank fields. To keep conversion rates high, ask for information that are likely to be on their profile. Ready to start collecting leads today? Sign in to LinkedIn Campaign Manager and create your first Lead Gen Form today.